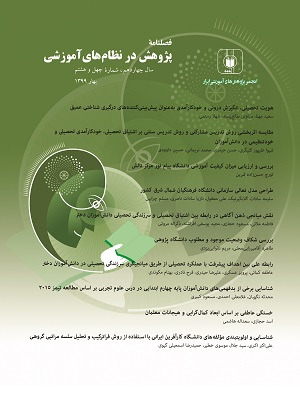 هاشمی, لادن, لطیفیان, مرتضی, حسین چاری, مسعود, فولادچنگ, محبوبه. (1392). بررسی نقش واسطه‌ای ارزش تکلیف در رابطه بین کمال‌گرایی مثبت و منفی و اهمال‏کاری تحصیلی. نشریه پژوهش در نظام های آموزشی, 7(21), 19-42. لادن هاشمی; مرتضی لطیفیان; مسعود حسین چاری; محبوبه فولادچنگ. "بررسی نقش واسطه‌ای ارزش تکلیف در رابطه بین کمال‌گرایی مثبت و منفی و اهمال‏کاری تحصیلی". نشریه پژوهش در نظام های آموزشی, 7, 21, 1392, 19-42. هاشمی, لادن, لطیفیان, مرتضی, حسین چاری, مسعود, فولادچنگ, محبوبه. (1392). 'بررسی نقش واسطه‌ای ارزش تکلیف در رابطه بین کمال‌گرایی مثبت و منفی و اهمال‏کاری تحصیلی', نشریه پژوهش در نظام های آموزشی, 7(21), pp. 19-42. هاشمی, لادن, لطیفیان, مرتضی, حسین چاری, مسعود, فولادچنگ, محبوبه. بررسی نقش واسطه‌ای ارزش تکلیف در رابطه بین کمال‌گرایی مثبت و منفی و اهمال‏کاری تحصیلی. نشریه پژوهش در نظام های آموزشی, 1392; 7(21): 19-42. فرازیر و همکاران ( 2004 ) و هویل و اسمیت ( 1994 ) با کمک نرمافزار لیزرل انجام گرفت . ارزشمندی تکلیف موجب افزایش اهمالکاری تحصیلی میشود..
بشارت، محمدعلی. (1383). رابطۀ کمال‌گرایی و مشکلات بین شخصی. دو ماهنامۀ علمی-پژوهشی دانشگاه شاهد، سال یازدهم-دوره جدید ، شماره 7 . دهقانی، یوسف. (1387). پیش‌بینی میزان اهمال‏کاری تحصیلی بر اساس راهبردهای خودتنظیمی در یادگیری. پایان‏نامه کارشناسی ارشد. دانشکدۀ علوم تربیتی و روان‏شناسی دانشگاه شیراز. Althen, G. (1988). American ways: A guide for foreigners in the United States. Yarmouth, ME: Intercultural Press. Bandalos, D. L., & Finney, S. J. (2001). Item parceling issues in structural equation modeling. In G.A. Narcoulides & R.E. Schumacker (Eds. ), New developments and techniques in structural equation modeling. Hillsdale, NJ: Lawrence Erlbaum Associates. Bieling, P. J., Israeli, A. L., Smith, J., & Antony, M. M. (2003). Making the grade: The behavioral consequences of perfectionism in the classroom. Personality and Individual Differences, 35, 163-178. Briody, R. (1980). An exploratory study of procrastination (Doctoral dissertation, Brandeis university 1980). Dissertation Abstracts International, 41, 590. Burka, J. B., & Yuen, L. M. (1983). Procrastination: Why you do it, what to do about it. Reading, MA: Addison-Wesley. Busko, D. A. (1998). Causes and consequences of perfectionism and procrastination: A structural equation model. Unpublished master's thesis, University of Guelph, Canada. Costa, P. T., Jr., & McCrae, R. R. (1992). The NEO Personality Inventory—Revised. Odessa, FL: Psychological Assessment Resources. Ellis, A., & Knaus, W. J. (1977). Overcoming procrastination. New York: Signet Books. Enns, M.W. & Cox, B. J., Sareen, J., & Freeman, P. (2001). Adaptive and maladaptive perfectionism in medical students: A longitudinal investigation. Ferrari, J. R (2004). Trait procrastination in academic settings: An overview of students who engage in task delays. In H. C. Schouwenburg, C. H. Lay, T. A. Pychyl, & J. R. Ferrari (Eds. ), Counseling the procrastinator in academic settings (19-28). Washington, DC: American Psychological Association. Flett, G.L., Blankstein, K. R., Hewitt, P. L., & Koledin, S. (1992). Components of perfectionism and procrastination in college students. Social Behavior and Personality: An international journal, 20, 85-94. Flett, G.L., Hewitt, P. L., Blankstein, K. R., & Mosher, S.W. (1995). Perfectionism, life events, and depressive symptoms: a test of a diathesis-stress model. Current Psychology, 14, 112-137. Frazier, P.A., Tix, A.P., & Barron, K.E. (2004). Testing moderator and mediator effects in counseling psychology. Journal of Counseling Psychology, 51 (1), 115-134. Frost, R.O., Heimberg, R.G., Holt, C.S., Mattia, J.I., & Neubauer, A.L. (1993). A comparison of two measures of perfection. Personality and Individual Differences, 14, 119-126. Frost, R. O., & Marten, P., Lahart, C., & Rosenblate, R. (1990). The dimensions of perfectionism. Cognitive Therapy and Research, 14, 449-468. Hill, R. W., Huelsmann, T. J., Furr, R. M., Kibler, J., Vicente, B. B., & Kennedy, C. (2004). A new measure of perfectionism: The Perfectionism Inventory. Journal of Personality Assessment, 82, 80-91. Hoyle, R.H., & Smith, G.T. (1994). Formulating clinical research hypotheses as structural equation models: A conceptual overview. Journal of Consulting and Clinical Psychology, 62, 429-440. Martin, T. R., Flett, G. L., Hewitt, P. L., Krames, L., & Szanto, G. (1996). Personality correlates of depression and health symptoms: A test of a self-regulation model. Journal of Research in Personality, 30(2), 264-277. Mills, J., & Blankstein, K. R. (2000). Perfectionism, intrinsic vs. extrinsic motivation, and motivated strategies for learning: A multidimensional analysis of university students. Personality and Individual Differences, 29, 1191-1204. Norman, R., Davies, F., & Nicholson, I. (1998). The relationship of two aspects of perfectionism with symptoms in a psychiatric out-patients population. Journal of Social and Clinical Psychology, 17, 50-68. Park, J., & Kwon, J. (1998). The effect of perfectionism and ego-threat of task on academic procrastination. Paper presented at the conference of Korean Psychological Association. Pintrich, P.R., & DeGroot, E. V. (1990). Motivational and self-regulated learning components of classroom academic performance. Journal of Educational Psychology. Vol. 82, No, 1, 33-40. Pintrich, P.R., Smith, D. A. F., Garcia, T. & Mckeachie, W. J. (1991), A manual for the use of the motivated strategy for learning questionnaire (MSLQ), University of Michigan. Rheaume, J., Freeston, M. H., Ladouceur, R., Bouchard, C., Gallant, L., Talbot, F., et al. (2000). Functional and dysfunctional perfectionists: are they different on compulsive-like behaviors? Behaviour Research and Therapy, 38,119-128. Saddler, C. D., & Buley, J. (1999). Predictors of academic procrastination in college students. Psychological Reports, 84, 686-688. Saddler, C. D., & Sacks, L. A. (1993). Multidimensional perfectionism and academic procrastination: Relationships with depression in university students. Psychological Reports, 73, 863-871. Seo, E.H. (2008). Self-efficacy as a mediator in the relationship between self-oriented perfectionism and academic procrastination. Social Behavior and Personality, 36(6), 753-764. Sobel, M.E. (1982). Asymptotic confidence intervals for indirect effects in structural equation models. In S. Leinhardt (Ed. ), Sociological methodology (1982)(pp.290-312). Washington DC: American sociological Association. Solomon, L. J., & Rothblum, E. D. (1984). Academic procrastination: Frequency and cognitive-behavioral correlates. Journal of Counseling Psychology, 31, 503–509. Stumpf, H., & Parker, W. D. (2000). A hierarchical structural analysis of perfectionism and its relation to other personality characteristics. Personality and Individual Differences, 28, 837-852. Tate, R. (1998). An ntroduction to modeling outcomes in the behavioral and social sciences (2nd ed. ): Burgess Publishing. Terry–Short, L. A., Owenes, R. G., Slade, P. D., Dewey, M, E. (1995). Positive and negative perfectionism. Personality and Individual Differences, 18, 663-668. Wernicke, R. A. (1999). Mediational tests of the relationship between perfectionism and procrastination (Master’s dissertation, American University, 1999). Masters Abstracts International, 37, 1982. Wigfield, A., & Eccles, J. S. (2000). Expectancy-value theory of achievement motivation. Contemporary Educational Psychology, 25, 68–81.